I’ve passed two days in Tbilisi Georgia, and I am truly amazed. Of course, my reaction to visiting a new place is largely determined by the reality as compared with my expectations, and perhaps my expectations were low going into this former Soviet satellite state. However, I’d like to think that even if I had reasonably high expectations, I’d still be quite pleasantly surprised. 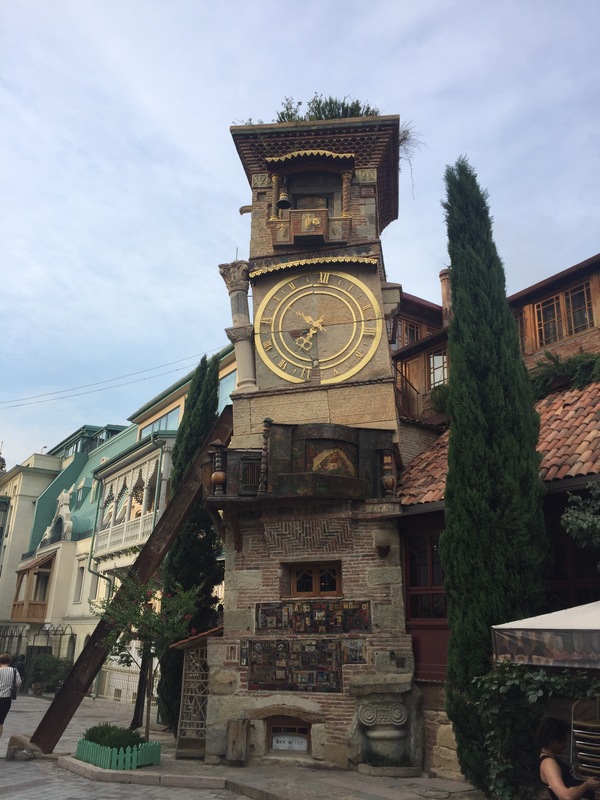 Here are a few thoughts on Tbilisi, Georgia – in no particular order. Tbilisi is a place in radical and continuing transition, and it shows signs of tension between the old ways and the new. Western-inspired, modern-looking buildings are under construction beside Soviet-era tenements. 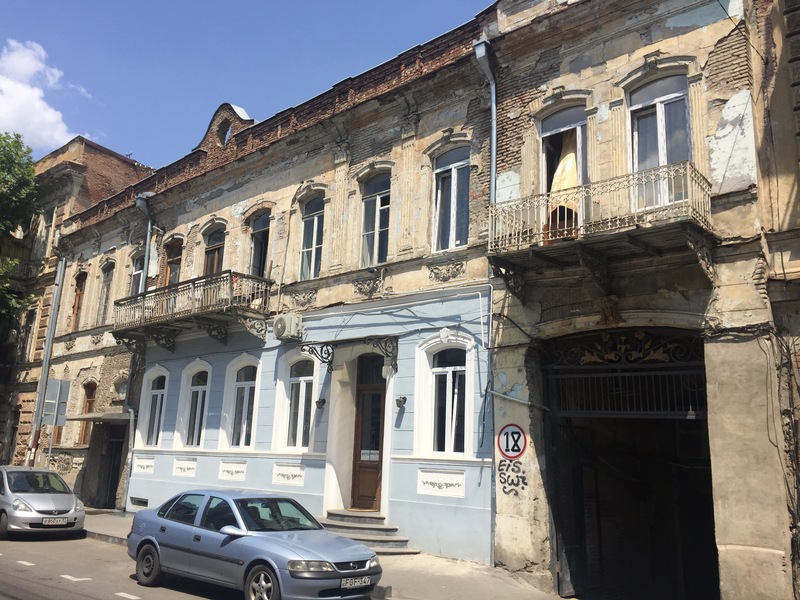 Reconstruction of old-building facades takes place at one storefront, but the crumbling fronts of adjoining structures are crumbling from age and weathering. Here’s where the contrast is most noteworthy: The Georgians are building impressive structures – but without fire escapes or sprinkler systems, and the workers don’t often wear hard hats or strap into safety harnesses. Distinct from other Eastern European countries, here there are many cars from this decade and popular in the West (Subaru, Honda, Ford, etc.) that are completely absent even from Germany but certainly from Poland or the Czech Republic. And those modern vehicles are often pieced together from scrapped cars from the United States – they often lack seat belts and functioning components. But they look genuine from the outside. Curious. The number of times my hosts said to me “Oh, that restaurant/café wasn’t here two months ago!” probably numbers in the dozens; the rate of new business creation is high, but business failure and turnover is equally high. A third point goes to support an article I published last month, in which I claimed that a visitor can tell a lot about a culture by watching its traffic patterns. Georgia is no exception. That it is a culture in transition is obvious immediately upon arrival at the airport. I pulled into town, so to speak, at 4 o’clock in the morning, was led by bus from the tarmac to an airport terminal that had opened a mere three days prior to my arrival – a new, shiny, well-lit building – and abruptly was halted by the most chaotic passport control I’ve yet experienced. The obvious problem was this: Georgians don’t do lines. Much as Italians don’t do café-lines, Georgians don’t do any lines. They do not queue. They mass, gather, push, shove, weasel, go round, and crowd. The authorities haven’t yet figured out that they might alleviate this habit by introducing some rope lines to the chaos. But alas, they’ve not figured this out yet. Efficiency for its own sake is not necessarily valuable, but sometimes efficiency is a virtue. Moving large groups of people from one place to another with minimal shoving is one example of a time when expediency and orderliness are undervalued in a place like Georgia. English is surely not as common here as it is in Qestern Europe, but I was surprised. Had I not been with my Georgian-speaking hosts, I would have been able to navigate well enough on my lonesome. And on to my last observation. The city is beautiful, despite (and in part because of) its confluence of cultures. Arabian-styled carpet dealers and hookah bars beside native-Georgian districts of restaurants, oddly-laid-out parks near round, glass, police stations that look like they’ve come straight out of Judge Dredd, and green mountains everywhere… it is a thing to behold, this city. I recommend a visit, and I plan to return, and my expectation that I’d have no desire or option to travel here again in the future is undone. The only thing I feel confident in asserting and expecting for a visit in the future is that this place will likely be wholly changed from its currrent appearance. Please visit my directory page for the 2017 summer trip, and please follow the site – it will email you whenever I post something new! *Addendum to the text above. This entry was posted in Travelogue, Travelogue 2017, Travels and tagged architecture, backpacking, beautiful cities, Culture, economics, europe, european travel, former soviet states, former USSR, georgia, places to visit, Politics, Slow Travel, tblisi, The Republic of Georgia, travel, traveling. Bookmark the permalink.